Children’s games present their own unique challenges when it comes to both game design and reviewing. Content aside, the game has to be simple enough that a child can figure it out on their own or the tutorial needs to carefully explain things, especially so that a parent can assist a child with the game if need be. The problem that can arise is that you need to carefully balance the difficulty with simplicity. Too hard and it’s frustrating, too easy and it’s boring. So, why bring this up? Because today we’re going to take a look at a children’s game that was designed by Arc System Works of BlazBlue fame and is being published by Aksys Games for the Nintendo 3DS. This is Family Fishing. 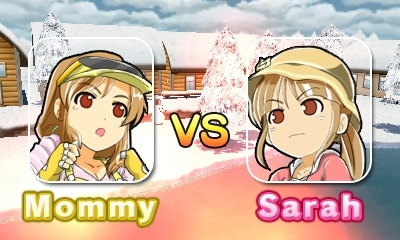 The Family series, or Okiraku as it’s known as in Japan, is a series of digital titles that started in 2008 with the release of Family Table Tennis/Okiraku Ping Pong Wii for the WiiWare service in Japan. Six more games, including this one, have been made and all have been published by Aksys Games for international release. The series stars Billy and Sarah, as well as various members of their family, with each entry focusing on a single game that’s been simplified so the whole family can enjoy it. That’s the intent, at least, but does it actually accomplish this goal? Let’s start with Family Fishing’s graphics and find out. While the environments don’t look all that bad, the character models leave a bit to be desired. The soundtrack does fit Family Fishing’s locations. The ice lake has a wintry sounding theme, for example. 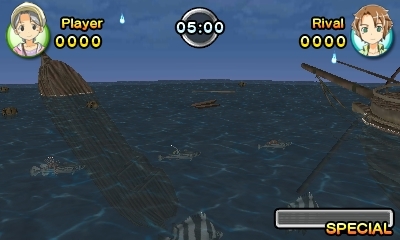 The only odd one out would be the theme for the ghost ship level, “Surprising Sea,” which sounds a little too energetic for a ghost ship, but is not a bad song. Sound-wise, the characters will all say various things in Japanese during the matches, menus, and will thank you for playing if you can clear the campaign mode as them. Even the sound effects just fit. There’s not really anything to complain about, but nothing that really stands out and grabs me. In regards to game design, there are some issues, but first let me explain the flow of gameplay. Your reward for clearing the campaign mode. A CG of your character and them saying “Thank you for playing” in Japanese. 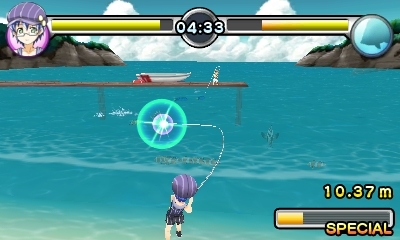 Family Fishing consists of three modes: Campaign, which will have you face seven characters in fishing matches to see if you can best them all; Free Battle, which allows you to choose your rival and stage; and lastly Survival, which will have you face an endless string of opponents to see how many victories in a row you can edge out. 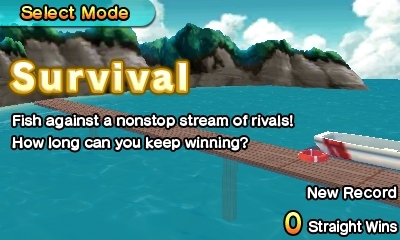 Once you’ve selected your character, rival, and stage, you’ll begin a five-minute match to see who can score the most points by catching fish. There are four classes of fish: small, medium, large, and boss. Different stages have different populations among these groups (the early stages have more small fish while the later ones are almost all large class) though each stage has only one boss fish. 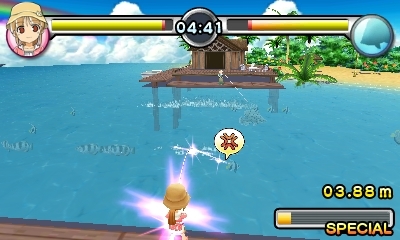 If the boss fish is caught, the match instantly ends, more than likely in the favor of the person catching it due to the point gain, but not necessarily. The game does give a lot of options here on how to approach your strategy. Do you go for the small easy fish, or try to land a few huge ones? Sadly, that question is not that simple to answer, as you have to still worry about equipment. Grandpa better not dispute your victory lest you send that shark after him, Big Sis! Every fish you catch gives you points towards your total and an equal amount of points in your wallet. At any time, you can go into the store and purchase a new rod, lure, and other items that are single use. The rods have various effects from quicker reeling in speed, to better defense or attack (more on that in a moment), to even filling your special gauge faster. In addition, you’ll need a lure, and this is one of the two areas Family Fishing can be a pain. Lures do not stack. What I mean by that is that if I buy a medium lure I can only catch medium fish. Same for the large lure. 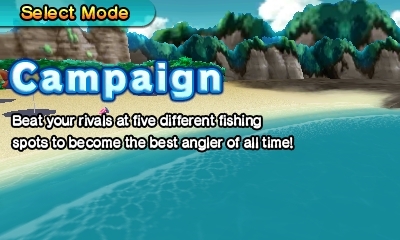 While, on one hand, this means I’m not accidentally catching small fish when I want large ones, it also means if I lose my lure due to a fish getting away and there are no small ones to catch, I may be stuck with a small lure unless I have extra points to spend. Lastly, we have the special items. These are single-use items that can further boost your attack or defense, or even help attract or anger the fish in an area. There’s a surprising amount of depth when you think about it, but these items don’t come cheap, and you’ll probably be spending most of your points on new rods and lures. So, now that you’re all set up, let’s take a look at the fishing itself and the other problem I have — the mechanics. The first thing you’ll do is pick where to cast your line and press the A button (If you want to use an item, though, do so before casting). A bar will appear on the left-hand side of the screen that will fill and empty automatically. The closer to the top it is, the more accurate your cast will be. Once your line is in the water, you’ll want to reel it in slowly with the B button. During this time, you can move the line left or right to zero in on nearby fish. Once you hook a fish, the game then becomes a bit more frantic. At the top of the screen will be two HP bars, one for your rod and one for the fish. 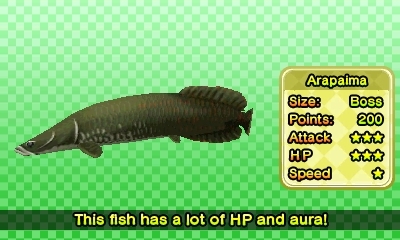 The fish will be pulling against the line and sending “aura” (just roll with it) towards you through the line. You’ll want to move the line in the same direction as the fish to minimize the damage you’ll receive and send some aura back. 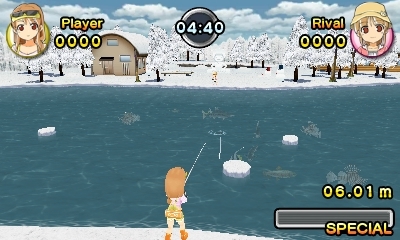 While this is happening, you can press the A button to quickly reel the fish in. 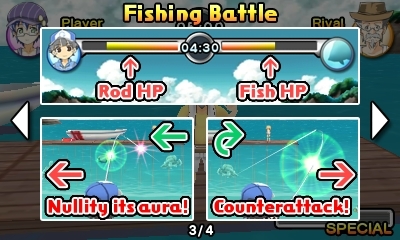 You’ll have to balance this, though, as, if you reel for too long, the fish will get angry and send a massive burst of aura that will take a chunk out of your HP. If you can outlast the fish or reel it in before your HP drops to zero, you’ll catch it. If not, well, you just lost your rod and lure and are back to a standard rod and small lure which, as I mentioned, can be detrimental. However, every character has a special ability that can help them turn the tide of a battle. This is activated with the R button once your special gauge is full. 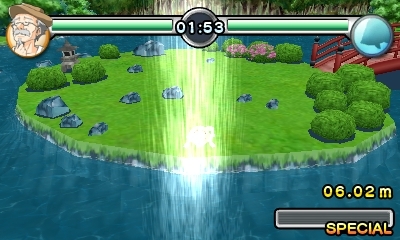 Once activated, you’ll have to input some fighting game style commands with the D-Pad which will enable your character to either buff themselves, attack the fish directly by, say, splitting the water apart with a punch, or throwing hearts at it to pacify it. 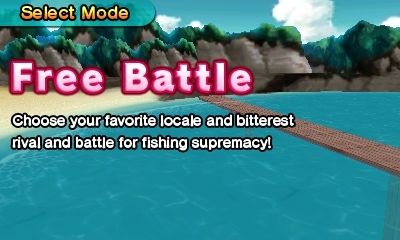 As complicated as this sounds, it all actually works quite well, and Family Fishing‘s gameplay is functional. Except for one thing — counterattacking. Successfully pulling of a counterattack. Counterattacking is your main form of damaging the larger fish and bosses. Family Fishing’s tutorial says to “pull up on your rod when the fish tries to turn to inflict lots of damage!” but the timing of this is more than a little unfair occasionally. I found it actually pretty difficult at times to nail down the timing, partially thanks to the fact that you don’t have a great view of the fish due to the camera angles. Also, rather than “pulling up,” I found it far easier to just snap the stick in the opposite direction to activate a counterattack, but it’s still spotty. The reason why this is a problem is that, without mastering the counterattack, you’re not going to outlast the larger fish very easily. 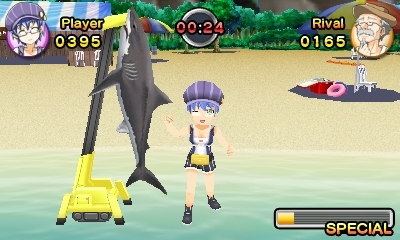 Yes, your HP does refill after every catch, but some fish are just so aggressive and have so much HP that they’ll whittle you down, and you’ll end up back to square one equipment-wise. I can potentially see this as being rather frustrating for younger players who just can’t get the timing down, especially as you can keep losing matches even with the best equipment you can purchase due to the larger fish constantly beating you and, thus, losing out on points when you desperately may need them. To be fair, it could just be my lack of skill, but it really does feel harder than it should be. Finally, let’s touch on one last thing, the characters. 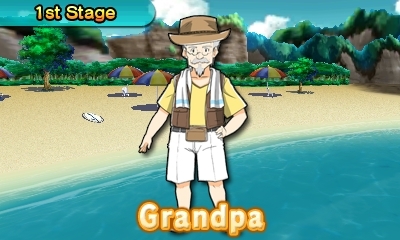 Grandpa’s Special move, the Water Split. Seriously, it’s kinda funny how many parts of this game remind me of G Gundam. Each character has their own starting equipment, as well, and some are really difficult to use. Namely, anyone with a “Chaos Lure” which allows you to hook any fish, but has a low hook rate. Meanwhile, others, like “Mommy,” can break the game right off the bat. Also, I realize this is not the first Family/Okiraku title and I can see what the localization team was going for, but “Big Sis” and “Big Bro” just sound so awkward in English. I can certainly believe “Mommy,” “Daddy,” “Grandpa,” and “Grandma,” but “Big Bro” and “Big Sis” are just literal translations of either Onee/Ane and Onii/Ani. It’s not commonly used in English, and I think names would fit better for these characters. So, what’s the final verdict here? Does Family Fishing work for its target audience or should even the kids stay far away from this one? 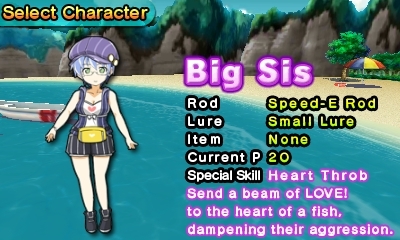 Armed with a fast rod and 20 extra spending points to start, and a special that calms fish down, Big Sis isn’t a bad starting character if you can land a few small fish to buy a new rod and lure. I have a lot of mixed feelings on this one. A lot of the base mechanics work, and the potential for depth does exist. The counterattack mechanic and the characters being unbalanced can cause some issues, however. Also, I need to note the biggest omission; no multiplayer of any kind. Family Fishing would have been perfect for ad-hoc battles between siblings or parent and child. The fact that this is omitted is more than a little strange. Then there’s the length and price. 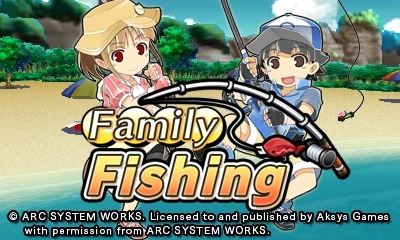 Family Fishing will run you $5.99 for a single player experience that can be cleared once in about two hours. Yes, you can go back and clear the game with the remaining seven characters, but, by the second time through campaign mode, I was pretty much bored with this one. In the end, it’s a decent effort, but I can’t really recommend it. If you do decide to pick it up for your kids to give it a try, just be aware that it’s a pretty short distraction. Thanks for the invitation, Billy and Sarah, but I think I’m going to head home early from this fishing excursion.